"nice and rough!!" just like Tina Turner says ! I love the heat of the hot sand touching my feet and toes. It is a complete different feeling from the sand of a beach. The earth in Africa tells you a lot of things and stories. Through your naked feet you get the power of Africa into your veins and it flows into your body to let you feel nice and rough. I always stop and make my destination of the day to be around 4pm. I set up fire so to have some good and thick layer of ash and coal for later to bake. I put a pot of water to prepare myself a nice cup of tea. I also use broth to drink should I have trekked that day. Something nice and hot slides down your chest nicely and there is nothing that quench your thirst more. I like to prepare interesting cocktail snacks to have it ready at sundown. The air starts becoming cooler, but not all at once. Did you ever noticed that air starts getting cooler in specific places before the whole of it gets to the same temperature? It is a nice exercise when you are walking into a dry riverbed. 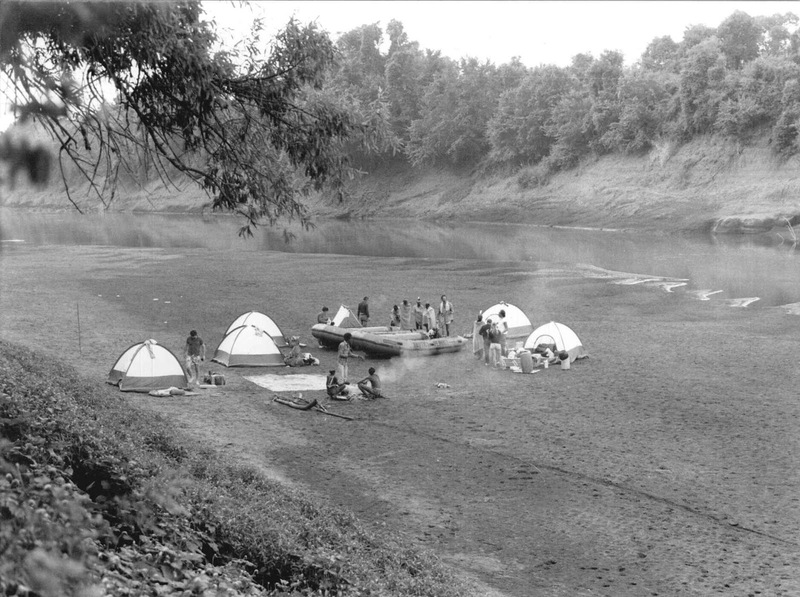 Well, that is one of the places where you immediately spot a string of cool air flowing following the course of the river. Sand gets cooler in the middle and at the very side of the edges. But if you are surrounded by rocky domes, like, for example, in Damaraland or NiassaNP you will feel the warmth of the rock protecting you and still giving you that warmth. The ground was a pale camel color before, it was almost orange when I stopped. It is rather dark beigesh/brownish now that the sun is showing its last red and still warm rays. The air smells different. It is like you could actually smell the wild of the skin of any animal, maybe a few gazelles, oryx or zebra wondering around. Cooking on stones is wonderful. Those shiny pots become pitch-black. I think, it gives you a perfect idea of how much the fire will works on them. Brushing all that smoke away also does help you remember. When you first camp your food is very simple. But the more you do it, the more it becomes wild. Sometimes I stop for more than three days in the same place, I dig out a big hole in the ground to make it an oven and bake stuffed chicken, baked potatoes and wrapped bananas! Sometimes, if I am in the mood, I bake bread and pizza. I enjoyed each day out in the bush and especially my Italian clients get very happy and joyful! I unfold my bed only at the last moment before going to sleep, not to give shelter to too many scorpions to enter my den. Roll down my plastic carpet and roll over my duvet. Then cuddle into it and I feel folded away. If it is hot, I just lay down on top of the "bed" and look up at the stars. I tried once to count them! I know it is impossible but, that night, I gave it a try to see, in that small stretch of the universe on top of me, how many were there watching me. When you concentrate it is easy to see a falling star. 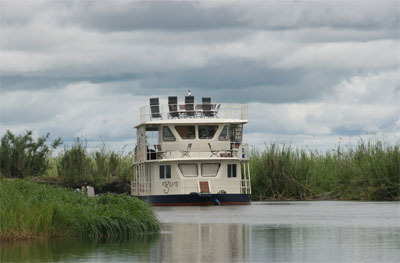 Also on the Zambezi River there is a ferry-boat that takes you for a cruise, just like Proud Mary, though only for a very short stretch, sometimes not so worth it. Nowadays it is difficult to find harsh places. I know some of them that will always give me that remote feeling to be out of this world. Travel industries have set up beautiful lodges, but some of them still give you that rough feeling. The wood of the beams is harsh and dry, the chairs not all the same kind, no platform under your tent, but only canvas stitched up on the ground. The veranda being the rest of the plastic floor of the tent stretched out a bit more for you to lay down on a big cushion. I had lions many times sleeping against my canvas tent, on the outside, of course! 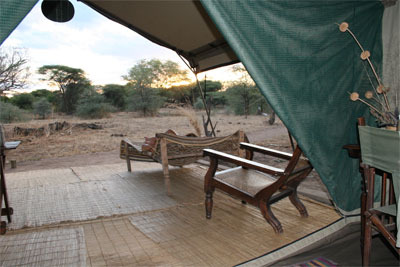 Elephants come and grab the pods hanging from branches of the acacia tree above my tent. You always wonder why, have they to get those, couldn't they just get others for that night, seeing that the place has "guests" ? 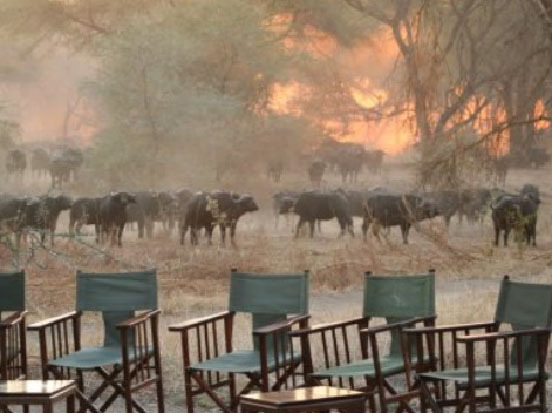 Then you hear hippos and bufalos wondering among our tents. It is nice and rough!